Today I am going to show you how to create a custom progressbar in android. Previously in another posts I have already shown how to build a custom indeterminate progressbar in android. And in this post I will show you how to customize the horizontal progressbar. OK Now we will start. First create a fresh project and name in “CustomProgressBarDemo_01” and name the Activity “CustomProgressBarDemo”. Now copy this code to the the “CustomProgressBarDemo.java” file. After pasting it you may get some errors but don’t worry in the coming lines we will remove all that. Now the layout file “main.xml” which contains the progressbar. 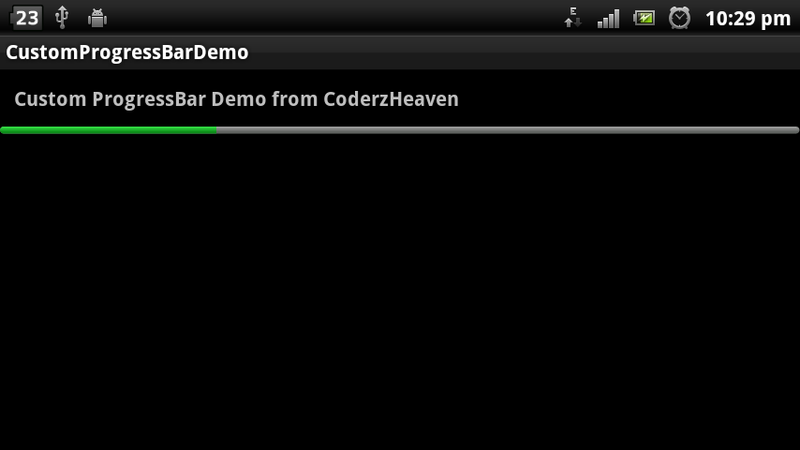 android:text="Custom ProgressBar Demo from CoderzHeaven"
There may be more errors. Leave it and continue. Now go to your drawable folder inside the “res” folder and create an xml named “green_progress.xml”. Copy this code into it. OK Now open the strings.xml inside the values folder and copy these code into it. Ok now I think your errors are cleaned. It’s time to run the project. You will see this screen. I have simulated this progressbar to run to end. Please share your comments and likes on this post.